Product #46017 | SKU E6OW5L1SL | 0.0 (no ratings yet) Thanks for your rating! The beige E6 Omnidirectional Earset Mic, Highest Gain, with Detachable 1mm Cable and TA4F Connector for Shure and Beyerdynamic Wireless Transmitters from Countryman is a vocal microphone with an adjustable boom that weighs less than one-tenth ounce. It is a water- and wind-resistant microphone that can be used on either ear for capturing audio in houses of worship, theatre, or outdoor vocal and speech applications. 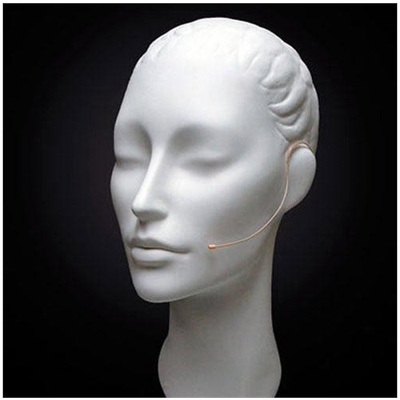 The low-profile, omnidirectional E6 Earset virtually disappears against the skin, so performers forget they're wearing a mic. Three sensitivity options cover general speaking to extremely powerful vocals and four colour options allow you to match the E6 to your skin tone for minimum visibility. In addition, the E6 Earset features three omni caps (very bright +8 dB, bright +4 dB, and flat +0 dB) that deliver response characteristics for most other applications such as recording flute and violin. The E6 Earset is available as a directional microphone too with cardioid and hypercardioid caps. This omnidirectional E6 Earset's cable terminates to a TA4F connector for direct connection to a Shure AXT100+, BLX1, FP1, GLXD1, PG1, PGX1, PGXD1, QLXD1, SLX1, UC1, ULX1, ULXD1, UR1, UR1M, or a Beyerdynamic TG 100 (gray switch) or TG 1000 (gray switch) wireless bodypack transmitter. Easy adjustment keeps the mic in a position for rejecting unwanted sounds. Countryman's omnidirectional Earset offers a reduction of 12 dB compared to a lavalier mic, while the directional E6 Earset provides even more isolation. Excellent for houses of worship, theatre, and outdoor events. An E6 replacement cable instals in seconds. The snap-on cables are rugged and available for almost any wireless transmitter or for XLR inputs with phantom power.